The Democratic nominee for governor in Florida who ran a primary campaign claiming he was the only "true progressive" in the race is proposing a 40 percent hike in the state's corporate taxes, and is selling the idea in-part by comparing his proposed tax rates to California, one of the highest states for corporate taxation in the nation. "By adjusting our state corporate tax level to a modest 7.75%, which allows our richest corporations to receive a tax cut and keeps our corporate tax rate more than 1% lower than California, we'll be able to recoup at least $1 billion and put it where we need it most — investing in our future," the Gillum campaign website says. Florida's current top marginal corporate tax rate is 5.5 percent, half-a-point lower than neighboring Georgia, and a full point lower than Alabama, according to data compiled at the Tax Foundation. Republicans are already highlighting the proposal as a stark difference between Gillum and the Republican nominee, Rep. Ron DeSantis. A recent report from the Sarasota Herald-Tribune produced a long list of civic and business entities as well as former politicians saying the issue was certain to create on of the bigger clashes in the remainder of the campaign. "National headquarters of companies in this state are focused on this like a laser beam," Tom Feeney, a former Republican Florida House speaker and president of Associated Industries of Florida, told the paper. Feeney's industry group represents some of the biggest companies in the state. "Punishing corporations by taking money out of the pockets of job-creators is going to have a chilling effect on this state's economy." Long-time Republican analyst Mac Stipanovich says the Gillum proposal is one more way in which the policy differences between the two major-party candidates will be more divergent than other Florida races this year or in years past. 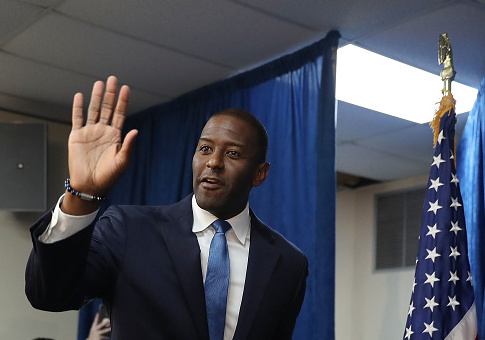 "What's odd about it is, is Gillum is so unapologetic about it." Stipanovich told the Free Beacon. "He doesn't try to say, ‘Well, what I really mean, and what this is…' No. This is what I mean: Let's increase the corporate income tax from [5.5] to [7.75], it'll raise a billion dollars, let's spend it on public education." Stipanovich also pointed to Gillum's proposal to expand Medicaid and to boost the state's minimum wage to $15 per hour as the other major differences between the two campaigns. The Republican Governors Association is currently running television ads taking aim at the proposed tax increase. "Gillum wants to increase Florida taxes by a billion dollars—disaster for the economy." the narrator for the RGA ad says. The Herald-Tribune also reported that the Florida Chamber of Commerce quickly donated $100,000 to the DeSantis campaign shortly after Gillum produced the upset win in the Aug. 28 primary. "We definitely don't see this as just a symbolic move by Gillum," said DeSantis spokesman Stephen Lawson. "It's very much in keeping with where he's going in this campaign." This entry was posted in Politics and tagged 2018 Election, Florida, Tax Hikes. Bookmark the permalink.